For information about a Chocolate making class in Perugina, you can check out a related post on the link. I am from Hershey..so of course I love this picture!! Mmmmmmmm! That looks delicious! Thanks so much for stopping by my blog and linking up for WW. This morning I downloaded several other apps for my iphone which include a fish eye lens. I haven't tried them yet, but can't wait!! Since you seem quite interested in this chocolate adventure of mine, I should probably explain those chocolate things on the photo. 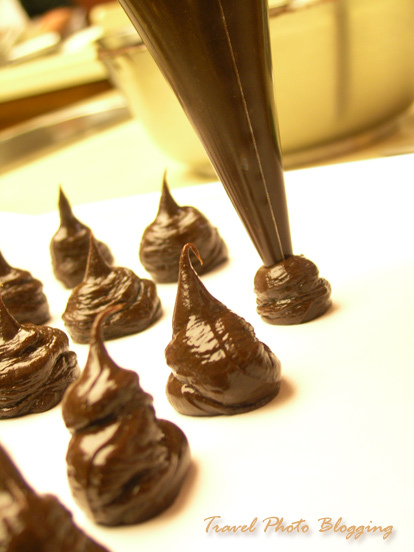 It is chocolate filling for truffles. These things are going to be made into balls, dipped into melted chocolate and rolled in some cocoa powder. Absolutely delicious! I guess this would be a trip you would definitely enjoy. Just remember to book well ahead since it seems quite popular. Oh yummy. That looks just delicious. I like truffles, especially rum truffles. Hello there from Kuala Lumpur,Malaysia. Just stumbled onto your blog. I like the chocolates from Perugia..Bacci! Small kisses all wrapped up. Thanks everyone. I hope you also checked out that link below the photo. We really had a splendid time at Perugina. Sponsored Video: See the world for free!